No one could doubt Chomsky's sincerity or his gratitude to the student protesters who brought the war in Vietnam to the forefront of public debate. On the other hand, he viewed the student rebels as 'largely misguided', particularly when they advocated revolution. 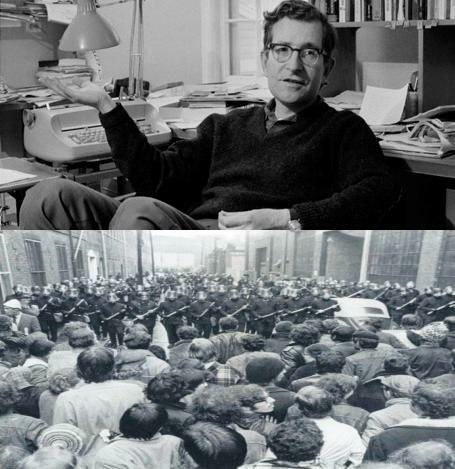 Referring to the student and worker uprising in Paris in May 1968, Chomsky recalls that he 'paid virtually no attention to what was going on,' adding that he still believes he was right in this. Seeing no prospect of revolution in the West at this time, Chomsky went so far as to describe US students' calls for revolution as 'insidious'. While he admired their 'challenge to the universities', he expressed 'skepticism about how they were focusing their protests and criticism of what they were doing' - an attitude that led to 'considerable conflict' with many of them. MIT's radicals not only organised occupations, they also organised a mass picket of the university's nuclear missile laboratories. Determined to put a stop to this kind of disruption, the university eventually had six students sentenced to prison terms. One of these students, George Katsiaficas, served time for the crime of 'disruption of classes'. To this day, he remains indignant about his treatment and says that the phrase, the 'banality of evil' - famously used by Hannah Arendt to describe Nazi war criminals - applies equally to President Howard Johnson. Adopting a quite different tone, however, Chomsky told Time magazine that Johnson was an 'honest, honourable man' and, in 1970, it seems he even attended a faculty party held to celebrate Johnson's success at coping with a year of student protests. Still more puzzling was Chomsky's attitude when Walt Rostow visited MIT in 1969. Rostow was one of those prominent intellectuals whom Chomsky had so eloquently denounced in his 'Responsibility of Intellectuals' article. As an adviser to both President John Kennedy and President Lyndon Johnson, Rostow had been one of the main architects of the war in Vietnam. In particular he was the strategist responsible for the carpet bombing of North Vietnam. Against this background, it was hardly surprising that when Rostow arrived at MIT, his lecture was disrupted by students furious at his presence on their campus. Far from associating himself with such student rage, however, when Chomsky heard that Rostow was hoping to return to his former job at MIT, he actually welcomed the prospect. Then, when he heard that the university was poised to reject Rostow's job application for fear of more student disruption, Chomsky went to Howard Johnson and threatened to lead MIT's anti-war students to 'protest publicly' - not against - but in favour of Rostow being allowed back to the university. Rostow wasn't the only powerful militarist at MIT to receive support from Chomsky. Twenty years later, Chomsky was, as he says, 'one of the very few people on the faculty' who supported John Deutch's bid to become university President. Deutch was particularly controversial because, as MIT's radical newspaper, The Thistle, explained, he was both an 'advocate of US nuclear weapons build-up' and 'a strong supporter of biological weapons, and of using chemical and biological weapons together in order to increase their killing efficiency.' In fact, by the late 1980s, Deutch had not only brought chemical and biological weapons research to MIT, he had apparently 'pressured junior faculty into performing this research on campus'. Fearing that the university was about to become even 'more militaristic', MIT's radicals - with the notable exception of Chomsky - joined others on the faculty to successfully block Deutch's appointment. Then, later, when President Clinton made Deutch No.2 at the Pentagon and, in 1995, Director of the CIA, student activists demanded that MIT cut all ties with him. Chomsky once again disagreed, The New York Times reporting him as saying of Deutch that 'he has more honesty and integrity than anyone I've ever met in academic life, or any other life.... If somebody's got to be running the CIA, I'm glad it's him.' Of course, the most remarkable thing about all this is that, throughout this entire period, Chomsky was churning out dozens of brilliantly argued articles and books denouncing the CIA and the US military as criminals, their hands dripping in blood. One way of making sense of Chomsky's various contradictory positions is to view them in the light of the public statements made by MIT's managers at the height of the student unrest in 1969. At this time, President Howard Johnson described his university as 'a refuge from the censor, where any individual can pursue truth as he sees it, without any interference.' Underlying such statements was Johnson's anxiety lest MIT's war scientists suffer 'interference' from protesting students and Johnson himself wasn't too consistent in defending this position, readily abandoning it when he declined Rostow's request to return to MIT. Unlike Johnson, however, Chomsky stuck to the university's principles. He remained true to the MIT's non-interference stance, even to the point of defending the right of a potential war criminal, John Deutch, and an actual 'war criminal' (Chomsky's description of Walt Rostow) to hold important posts at the university. Part of the explanation for all this may have been Chomsky's reluctance to fall out with fellow faculty members, especially those with whom he associated regularly. As he remarked at one point, 'I'm always talking to the scientists who work on missiles for the Pentagon.' But there must have been more to Chomsky's thinking than this. In 1969, one MIT student is reported to have justified his opposition to the university's military research on the grounds that 'one doesn't have the right to build gas chambers to kill people', adding that 'the principle that people should not kill other people is more important than notions of freedom to do any kind of research one might want to undertake.' Chomsky, by contrast, extended the principle of academic non-interference to unusual lengths. It was crucial to him that MIT held strictly to the management ideal of the university as 'a refuge from the censor'. After all, a less libertarian policy might have undermined his own conflicted position as an anti-war campaigner working in a laboratory funded by the US military. None of this makes Chomsky's opposition to US militarism any less genuine or admirable. If anything, his dissidence was all the more remarkable given the context in which it was expressed. My aim here is simply to highlight how conflicted Chomsky must have felt, being a committed anti-militarist in an institution so closely associated with a war machine that was inflicting so much death and misery across the globe. So it appears that, despite his sincere and often courageous opposition to the US military, Chomsky felt a simultaneous pull in the opposite direction, prompting him to tone down criticisms of MIT in order to protect his ability to continue with the job he loved. My own view is that the intensity of Chomsky's anti-militarist dissidence can be explained in part by his need to square his continued MIT employment with a political conscience that refused to lie down. I have no space in a short article to explain how such moral dilemmas influenced not only Chomsky's political work but also his linguistics. Suffice it to say that Chomsky was hired to work at MIT by Jerome Wiesner, a military scientist who, in the 1950s, was arguing 'fervently for developing and manufacturing ballistic missiles.' Wiesner was an adviser both to the CIA and to President Eisenhower and it is hard to think of anyone in US academia who was more deeply involved in both the technology and the decision making of nuclear war than he was. Wiesner initially employed Chomsky because, as he said, '[We wanted to] use computers to do automatic translation, so we hired Noam Chomsky and Yehoshua Bar-Hillel to work on it.' In this Cold War period, the US military were investing millions of dollars in linguistic research not only to automatically translate Eastern bloc documents but also to enhance their computer systems of 'command and control' both for nuclear war and, later, for the war in Vietnam. Chris Knight is author of Decoding Chomsky: Science and revolutionary politics (Yale University Press, 2016). * N.B. Chomsky's classic article, 'The Responsibility of Intellectuals', can be found here. 1. R.Barsky, Noam Chomsky, a life of dissent, p122, 131; N.Chomsky, American Power and the New Mandarins, p17-18. 2. G.D.White, Campus Inc., p445. 3. M.Albert, Remembering Tomorrow, p97-99; C.P.Otero, Noam Chomsky: Language and Politics (2004), p216. Any university that restricted its research to the development of military technology would soon run out of new ideas so MIT does a lot of pure science, including linguistics. But, as Michael Albert says, 'War blood ran through MIT's veins. It flooded the research facilities and seeped even into the classrooms.' In the late 1960s, some 500 students worked in MIT's military laboratories. Most of these students worked in the Instrumentation Laboratories that were part of the engineering school and which, in Chomsky's words, were only 'two inches off campus' with people going 'between them all the time'. MIT also did military research 'on campus' for both the Navy and the CIA. Albert p99; MIT Review Panel on Special Laboratories, Final Report, p59-69; Works And Days 51-4: Vol. 26/27, 2008-09, p533; MIT Bulletin, Report of the President, 1969, p237-40, 255; The Tech, 31/10/69, p1, 10. 4. 'Why Smash MIT? ', in I.Wallerstein, The University Crisis Reader, Vol.2 p240-3; Albert p113-4. 5. Stephen Shalom, New Politics, Vol.6(3). 6. MIT Review Panel on Special Laboratories, Final Report, p37-8; Albert p98. 7. J.Segel, Recountings; Conversations with MIT mathematicians, p206-7; N.Chomsky, 'MIT 150 Infinite History Project'. 8. The Tech, 14/12/71, p8 and The Tech, 4/8/72, p1. 9. www.eroseffect.com/articles/holdingthecenter.pdf; Time, 21/11/69 p68 and 15/3/71 p43; H.Johnson, Holding the Center, p202-3. 10. N.Chomsky, Chomsky on Democracy and Education, p311; Albert p9, 16. Chomsky's discomfort with any kind of illegal or confrontational action at MIT was shown again, in 2011, when the university cooperated with the prosecution of Aaron Swartz for the 'crime' of downloading Jstor journals from MIT's library. Although Jstor agreed to a deal whereby Swartz would avoid prison, MIT apparently rejected this deal and the threat of decades in prison helped drive Swartz to suicide. When asked about this tragic event, Chomsky did say that MIT should have acted differently. However he also implied that Swartz should have been prosecuted - if only for a 'misdemeanour' - and he then said: 'If you take Jstor and make it public, Jstor goes out of business ... [and] nobody has access to the journals. ... You can't just liberate things, pretending you don't exist in the [capitalist] world.' 'Noam Chomsky at the British Library' (video, at 1hr.30mins. ); The Boston Globe, 15/1/13; The Atlantic, 30/7/13. See also: 'Passing Noam on My Way Out, Part 2: Chomsky vs. Aaron Swartz'. 11. The Tech, 14/12/71, p8; S.Diamond, Compromised Campus, p284-5; N.Chomsky, Class Warfare (1999), p137; White p445-6; R.Chepesiuk, Sixties Radicals, p145. 12. D.Milne, America's Rasputin; The Tech, 11/4/69, p1, 8. 13. Barsky p141; 'TV debate between Noam Chomsky and William Buckley'. 14. Chomsky, Class Warfare, p135-6. 15. The Tech, 7/3/89, p2, 16 and 27/5/88, p2, 11; The Thistle, Vol.9 No.7. 16. 'MIT students allege defense conflict', UPI, 2/6/89; The Tech, 2 March 1990, p7; The Tech, 2/3/90, p7; The Thistle, Vol.9 No.7; The New York Times, 10/12/95. 17. MIT Bulletin, Report of the President, 1969, p3. 18. J.Wiesner, Jerry Wiesner, p582; Johnson p189-90; Barsky p141. 19. N.Chomsky, Understanding Power (2013), p10. 20. The Tech, 22/4/69, p1. 21. The New York Times, 27/10/68. 22. New York Review of Books, 25 March and April 1967. 23. The New York Times, 23/10/94; D.Welzenbach, 'Science and Technology: Origins of a Directorate', p16, 21; L.Smullin, 'Jerome Bert Wiesner, 1915-1994, A Biographical Memoir', p 1, 7-10, 20; D.L.Snead, Eisenhower and the Gaither Report, p189; M.Rosenberg, Plans and Proposals for the Ballistic Missile Initial Operation Capability Progam, piii-iv, 6-11, 17-22. 24. S.Garfinkel, 'Building 20, A Survey'; J.Nielsen, 'Private Knowledge, Public Tensions: Theory commitment in postwar American linguistics', p 39-42, 194, 338-42; F.J.Newmeyer, The Politics of Linguistics, p84-6. Wiesner went on to say, 'It didn't take us long to realize that we didn't know much about language. So we went from automatic translation to fundamental studies about the nature of language.' Wiesner later became critical of US policy on both nuclear weapons and on the Vietnam war but this did not stop him from continuing to oversee MIT's huge military research program which he, naturally, justified on the grounds of 'academic freedom'. The Tech, 28/4/72, p5; L.Kampf, 'The University in American Power' (audio, at 48mins.). 25. Another academic dead-end, in the form of postmodernism, befell cultural theory and it is notable that MIT also played a formative role in that intellectual disaster. See: B.Geoghegan, 'From Information Theory to French Theory', Critical Inquiry 38 (2011). [MIT] is the freest and the most honest and has the best relations between faculty and students than at any other university"
This surprisingly naive approach to Stalinist dictators seems to have created a mindset that meant that Chomsky was unable to admit the full horror of Pol Pot's dictatorship in Cambodia in his 1979 book, After the Cataclysm. (5) But as Knight's article shows, naivety was not Chomsky's main issue, it was guilt. The point in the above quote where Chomsky blames the Solidarity group for contributing to 'the crushing of Vietnamese independence' is crucial. Clearly, Solidarity could not be held responsible for the Vietnam War in any way. (6) That would be taking what Chomsky calls 'the responsibility of intellectuals' too far. In fact, Chomsky's position only makes sense if we appreciate quite how guilty he must have felt about working for a university funded by the same war machine that was devastating South East Asia. 1. http://buckley-chomsky.weebly.com/debate-part-5.html. Elsewhere, Chomsky uses phrases like 'mutual aid', 'popular control', 'mass participation', 'nonviolence' and even 'liberal humanism' to describe some of Mao's policies in China. N.Chomsky, American Power and the New Mandarins p137; https://chomsky.info/19671215; New York Review of Books, 13/2/69. 2. 'The Great Leap Forward Famine' Wikipedia page. 3. Chomsky does now accept that Mao's regime was responsible for what he calls 'a huge death toll, in the tens of millions'. But his version of anarchism is still rather 'conservative'. As he says: 'In the case of workers taking control of the workplace ... I think what we should do is try [any changes] piecemeal. In fact, I have a rather conservative attitude towards social change: since we're dealing with complex systems which nobody understands very much, the sensible move - I think is to make changes and then see what happens and if they work, make further changes. That's true across the board, actually.' Indeed, when asked about the prospects for revolution, Chomsky says: 'We are so remote from that point that I don't even see any point speculating about it and we may never get there. Maybe Marx is right that within parliamentary democracies you can use institutions themselves to go to a sharp institutional change.' Considering these comments, it is no surprise that Chomsky has defended Syriza's disastrous tactics and he has recently encouraged people to support both Jeremy Corbyn and Podemos - and, naturally, he also advocated a vote for Hillary Clinton in key states. Truth-out.org interview with C.J.Polychroniou, 17/7/16; N.Chomsky, Understanding Power p201; 'Christopher Helali interviews Chomsky' at https://chomsky.info/20130312; Jacobin Magazine 24/9/15. 4. https://chomsky.info/197401__; Bob Potter, 'Vietnam: Whose Victory?' (Solidarity). Elsewhere, Chomsky says 'there appears to be high degree of democratic participation at the village and regional levels [of North Vietnam].' New York Review of Books, 13/8/70.